Macarons are becoming quite the trend. With reports of the cupcake bubble being popped these delightful little french cookies could be making their way to the top of the food craze chain. If you're unfamiliar with a macaron it's important to know the difference between "macarons" and "macaroons". French Macarons are delicate french cookies carefully made up of almond meal, egg whites, powdered sugar and granulated sugar while Macaroons are egg whites mixed with sweetened flaked coconut and sometimes dipped in chocolate. Making a macaron is much harder than a macaroon. These fragile cookies have a reputation of being temperamental due to the egg whites. Over whip them or under whip them, don't let them dry out long enough, fail to use aged egg whites, or you can do everything right and STILL end up with cracked macarons. The saddest sight to see after working so hard for such a tiny cookie. But I digress. When done right these little darlings are delightful! Perfectly chewy, sweet and almost like eating a little cloud. Aside from the standard Chocolate or Vanilla lies a wild array of flavor combinations for this complex cookie. I still haven't overcome my fear of failing at macarons, I'm sure at some point I'll attempt them but for now I leave you with some successful macaron recipes! Chocolate Banana Macarons x Design. Bake. Run. Happy SITS Day! I don't think I've ever heard of macarons before! Thanks for the clarification--I didn't realize the difference and I also didn't realize they were a little difficult to make. I love the aesthetics of these little cookies--they photograph so nicely; they're like little pieces of art. Thanks for sharing! Happy SITS day! These would go over big at my house. They look delicious but I will leave them for my daughter to make. I will pass on these recipes to her! Baking and I do not mix...I have many horror stories! Happy SITS Day and thanks for explaining the difference here between the two. Happily following you now on FB and Twitter, too. Hope you can do the same at: Janine's Confessions of A Mommyaholic. Happy SITS Day! If you have any "spring" themed recipes you'd like to link up to the Spring Fling, Blogger-Style! link-up going on right now, we'd love to have you! :) (You can find it by going to my Natural and Free blog.) If you can't, it's cool, but I wanted to extend the invite to you. :) Have a great day! I definitely was asking the question in my head after reading your first sentence. I'm glad you clarified. I've noticed that these are usually pastel colored. Is this a flavor thing or food coloring thing? 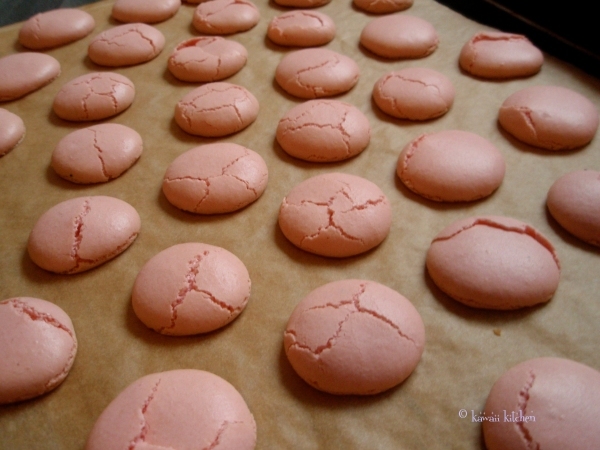 Frankly, a cracked top macaron still tastes just as nice! Love the Blog and congrats on all your Foodie accomplishments. I love, love macaroons - yummo. Food blogs are always fun to read. Happy SITS Day, and congratulations on being featured blogger. Hope you have a blessed day! Happy SITS day!! These look delicious! I'd never even heard of these cookies before. At first I thought you were talking about a macaroon. LOL Glad you explained. I don't think I have ever had a macaroon. Crazy, I know! CONGRATULATIONS on your SITS Day! Love your blog! Those look scrumptious! Happy SITS Day! Thanks for pointing out the spelling difference. I kept seeing those and thinking, "Those aren't the macaroons I remember." I don't think I've ever had a macaron. They sound yummy. Guess I'll have to try one. Hope you have a great SITS Day. I never heard of those. I know macaroons but not the other. Congratulations on your SITS Day!!! I'm embarrassed to say that I've never tried a macaron before. Macaroons, yes. These look delicious; I'll have to give them a whirl :) Though I'll leave the baking to someone else--I'm nervous when it comes to baking temperamental recipes. XOXO and you have an adorable blog! Happy SITS day! I love food! I never knew the difference with macaroons.